Synopsis: Iris Murdoch (Judi Dench), internationally renowned author and philosopher, is eking out a quiet semi-retirement with her academic husband John Bayley (Jim Broadbent). Prompted by atypical lapses in memory, Iris reluctantly agrees to visit a doctor, who diagnoses Alzheimer’s disease. Iris must contend with a gradual erasure of her memory and personality, and John is forced to come to terms with her decline. The film meanwhile tells the story of their early life, and Iris’s vivacious and, to John, often infuriating personality, in flashbacks (with Kate Winslet and Hugh Bonneville). Iris is a straight-down-the-line, middle-of-the-road, effective but mostly just functional biopic. There, I’ve said it. At surface, there doesn’t seem that much that’s special about it. I tend to agree with Roger Ebert’s assessment, that in focusing on the tempestuous beginning and sad end of Murdoch’s literary life, it cuts out the aspects of her that are most important: the brilliance of her work, the fierceness of her intelligence. What I think is interesting, however, is the use of two stars playing the central role at different ages. There is nothing unique about this. (The latest major biopic I can think of that has chosen this route is Love and Mercy, starring Paul Dano and John Cusack as the younger and older Brian Wilson.) Most biopics have younger actors portraying the protagonist at earlier life stages. What’s different about Iris is its use of two stars with quite different personae, performance styles and physical appearances to play its subject. Film stars bring with them not only marketability, but also a constellation of expectations – about what kind of film this is, about the personality of the character they portrayed, even about what kind of response you as a viewer should have to the character. Some of this is extra-textual (i.e. ideas we impose from outside of the film itself, often information we have from what we know of the star’s personal life). And some of it is to do with performance style. When films are about real life personalities, though, the expectations we have about character are drawn not only from the star, but also from our knowledge (however partial or even incorrect) about the subject. Biopics scholar George Custen put it this way: ‘the moviegoer is drawn to resonant aspects of the impersonator as well as the life impersonated.’ He gives the example of the Bette Davis, who tended to play powerful, dominant women, portraying Elizabeth I in The Private Lives of Elizabeth and Essex (1939). In the case of Iris, the subject of the film was portrayed in two different time periods – glibly summarised by A N Wilson as the ‘bonking’ and the ‘bonkers’ phases of Murdoch’s life, – by two star performers who bring with them two separate sets of performance expectations. Dame Judi Dench, usually portrays regal, powerful figures, so her star persona is based around her personal magnetism, gravitas and quiet grace. Kate Winslet’s star persona at the time, on the other hand, invoked dynamism, youth and vitality. Christine Geraghty has suggested that Winslet brought a Hollywood-style performance of freedom and physicality to her roles in British heritage films, a genre/mode more readily associated with constraint and reserve. The film exploits these star personae in order to separate its two versions of Murdoch. This seems to be deliberate in Iris, taking into account the physical dissimilarities between the younger and older Irises (Winslet is considerably taller than Dench, with longer limbs) in comparison with the efforts to make Hugh Bonneville and Jim Broadbent look the same as John Bayley. The youthful star persona of Winslet is exploited to exaggerate the young Iris’s sexuality, provocativeness and energy. 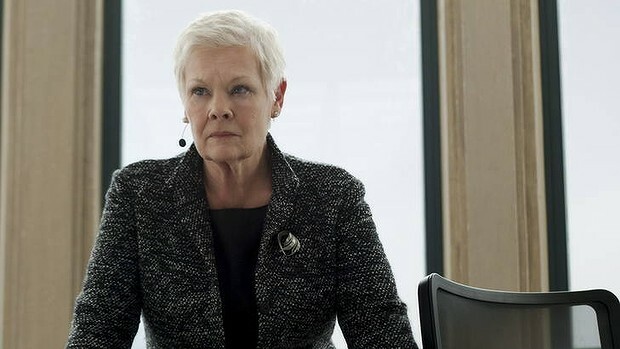 Judi Dench’s performance of the older Murdoch’s dignity in the face of the realisation that she will eventually lose her mental faculties to Alzheimer’s disease recalls other moments of her career in which similar moments of overwhelming emotion are performed with quiet restraint. In the case of Iris Murdoch, not only are Dench and Winslet playing a real person, but also portraying in audiovisual media an individual whose image was recorded in audiovisual media, a person who existed in living memory. A key moment in Iris ties together these issues of performance, interpretation and impersonation. Dench’s Iris visits a television studio to be interviewed by broadcaster Joan Bakewell. Before being led into the studio, Iris views on the monitors in the gallery archive footage of her younger self being interviewed for television. This ‘archive’ material, in fact, features Winslet performing what we might assume is an impersonation of a television interview with Murdoch she has studied. It is perhaps this one, with Frank Kermode, made especially for sixth form students and broadcast in 1965. Winslet conveys Murdoch’s playfulness well, and captures her searing stare into the eye of her interlocutor. I think she misses the careful speech patterns though, the reticence before speaking so that Murdoch can ensure she has found the correct turn of phrase, which is ironic given the film’s insistent focus on the importance and value of language. Dench then performs as the older Iris in the studio, with a large photograph of herself-as-Murdoch in the background. Here the film invokes both the celebrity of the real Murdoch – represented in the large portrait of her in the background – and the celebrities of the two actresses. This confusion between impersonated and impersonated even continued into the marketing materials – even a tie in reprint of Bayley’s memoir, which bears Dench’s image on its cover in the place of Murdoch’s. Iris, then, integrates two quite different performance styles but also uses both references to real-life mediations (TV interviews, for example) and extra-textual materials (like a tie-in book) to re-emphasise the relationship between actor and subject. You could read this as a marker of anxiety – that the viewer needs to be reminded that these two quite separate actresses are the same person. Alternatively, you could view these differences in performance style, and their emphasis as deliberate (or, at least, productive). This separation between the old and young Iris contributes significantly to the film’s central themes, of the fallibility of memory, and the centrality of memory to identity and personality. The tragedy of Iris’s story, one that the film wishes to emphasise, is that her failing capacity to remember engenders a decline in her identity. It is not simply that Winslet and Dench play Iris at different ages. It is that they play two different versions of the same person. Christine Geraghty (2002), ‘Crossing Over: Performing as a Lady and as a Dame’, Screen 43:1, pp. 41 – 56.